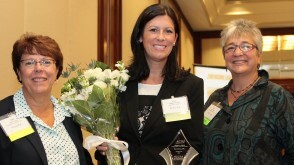 Kara Stevens, Director of the Accounting Programs, Assistant Accounting Professor, was recognized as one of six “2015 Women to Watch,” and named an “Emerging Leader,” by the Massachusetts Society of Certified Public Accountants (MSCPA) at an awards ceremony on October 29, 2015. This recognition was received for meeting the following criteria: mentoring other professionals; leadership in workplace initiatives and improvements; overall contributions to the profession and workplace; public or community service; and involvement with colleges and universities. Kara shared her enthusiasm for the accounting profession and the MSCPA organization in the following interview. What has your involvement with the MSCPA been? I have been involved in the MSCPA since I started working in public accounting in 2004. During my time in public accounting, I began to do a lot of speaking events for the organization—going to various colleges, universities, and high schools to talk about the profession and talking with students as they’re trying to figure out their careers. I encourage students to become members of our MSCPA. The organization offers scholarships to students and provides great networking and professional development opportunities. Over the summer, I helped organize an MSCPA conference for CPE (Continuing Professional Education) credits that brought more than 60 CPAs to the Bay Path campus. The day began with a meet-and-greet with Amy Pitter, the CEO of the organization. We plan to hold another MSCPA Conference at Bay Path University in the spring of 2016. As a leader in the accounting field, how do you take initiative and inspire other women to get involved? I believe in the accounting career path. There are wonderful jobs and opportunities in the field. At Bay Path, we’re women-focused, and this is a profession that can be women-focused as well. In our rich academic courses, students learn the fundamentals of accounting and build confidence in their abilities. We offer them real life practical experiences—working with our career services department, students are placed into internships that give them the opportunity to discover the area of accounting that is their best fit. This fall, we offered a business panel event on campus with three CPAs from the area—the CFO of Freedom Credit Union, an entrepreneur that started her own CPA firm, and a CPA who’s the tax manager for one of the Big Four accounting firms—an array of different career paths for accountants. Students were able to get business cards from these CPAs and did brief mock interviews. I offer extra credit to students to go to networking events like this one and each semester provide them a list of opportunities in the region for meeting field professionals. As a result, they have a network they can turn to when they’re looking for internships and jobs. A great way for students to get their resumes to really shine is through volunteerism. During this semester, our students taught over 17 classes on financial literacy through Junior Achievement of Western Massachusetts at Central High School in Springfield, MA. The two-fold experience in volunteering and reinforcing these concepts helped our students strengthen their leadership skills. Also, working closely with Dr. Tom Loper, I helped develop and launch the MS in Accounting program that is now in its second year. The program provides accountants, aspiring accountants, and particularly our undergraduate students an opportunity to complete their next level of accounting here at Bay Path, and offers different areas of focus to tailor their experience and give them an advantage in the marketplace. There are three unique concentrations within the MS in Accounting program: Public Accounting (CPA track), Private Accounting, and Forensic Accounting. It’s no secret that women tend to be underrepresented in the field of accounting. Can you speak about the glass ceiling? The interesting thing is that we’re seeing 50% male and 50% female going into accounting programs at co-ed schools. We’re also seeing 50% male and 50% female landing the jobs. But then, something happens as women continue to move up the ranks and top management is still dominated by males. We are aware of this situation and my advice to students is to find employers who have a flexible work culture that fits your needs as you continue to grow. Do your homework about these employers, ask the questions, and look at the organizational structure. If you don’t see any women leaders in executive roles, that may be a red flag that they may not be an employer that works with women to get to the next level.